← I always save a special place for books in my designs. Here we are in 2014! I survived another Holiday season, hosting Christmas Eve and creating the warm and welcoming atmosphere my children and Santa love (Wink – wink)… The gift shopping and wrapping marathon is over. The Elf on the Shelf traveled safely back to HQ in the North Pole. The meal planning and cooking frenzy is past and was enjoyed. The ornaments are back in their boxes and pine needles have been vacuumed and vacuumed and vacuumed. New Year’s Eve was celebrated with good friends and kids lit sparklers at midnight. Now the New Year has begun, and the first order of business is to get organized. With the excitement of owning new toys from parents and relatives and special gifts from Saint Nick, comes the dread of, “Where will all this be stored?” Without a basement or an attic to box away older items, our things can “take over”. For several days after Christmas, I could not walk into my children’s rooms without stepping on something “plasticky”. Solution number one was, of course, to clean up the closets and storage spaces by making room for the new by ridding ourselves of the old. I dedicated an entire day to this, and was very pleased with the donations it produced: bags of clothing, toys and books my kids had outgrown, household items I realized I had never used, and the likes. Once the clutter was eliminated, solution number two is a designer’s favorite: vertical storage! I love to use a pair of bookshelves, cabinets, or a built-in unit to address storage issues in my designs. 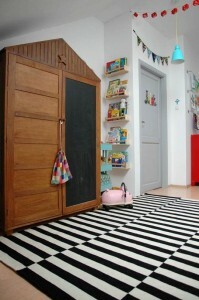 This is a “win-win” solution for families; shelves and built-ins create symmetry and balance. They add interest by bringing the eye up to become a room’s beautiful focal point. Repeat the height of your shelves with floor to ceiling curtains and voila! You get instant design with a significant purpose. Built-ins added character to my daughter’s rooms and my home. If you use open shelves, there is an opportunity for an artful display along with storage compartments. So if you are struggling with storage issues, don’t over-think it. Vertical storage is the better solution. With added shelves or built-ins, your space will feel more finished and more spacious, and you won’t need to navigate your children’s rooms as you would a land mine field.